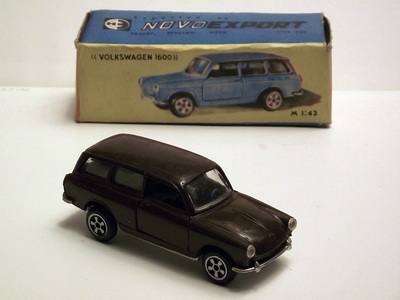 ​NOVOEXPORT was the export organization of the former USSR. 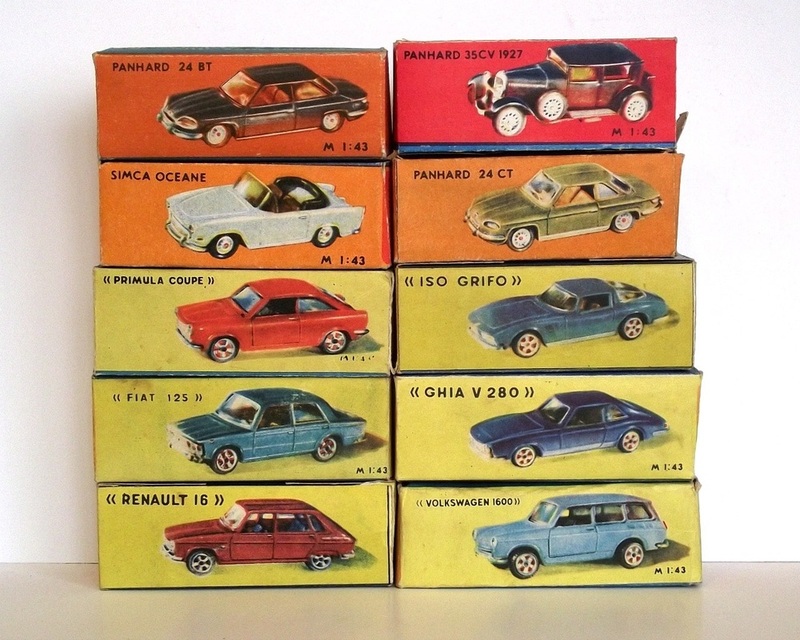 These plastic scale model cars were built at a scale of 1:43 in two factories, one located in Tbilisi (today the capital of Georgia) and one located in Donetsk (today a major city in Ukraine). 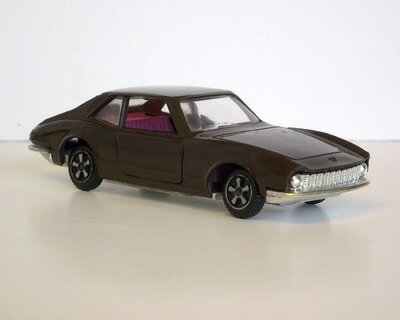 The model cars built in Donetsk used a shiny plastic while the model cars built in Tbilisi used a more matt plastic and they also seem to be better made. Model cars built in Tbilisi have more clear details, transparent headlamps and painted tail lights. 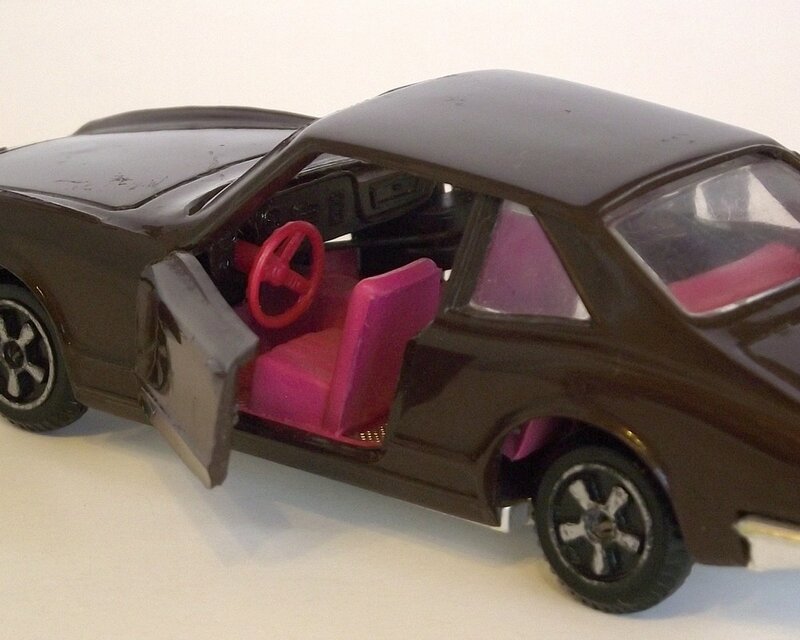 The wheels used were different too. Model cars built in Donetsk had slightly larger wheels on thin steel axis acting as suspensiom while model cars built in Tbilisi had slightly smaller wheels on a solid steel axis with a internal suspension that works better. 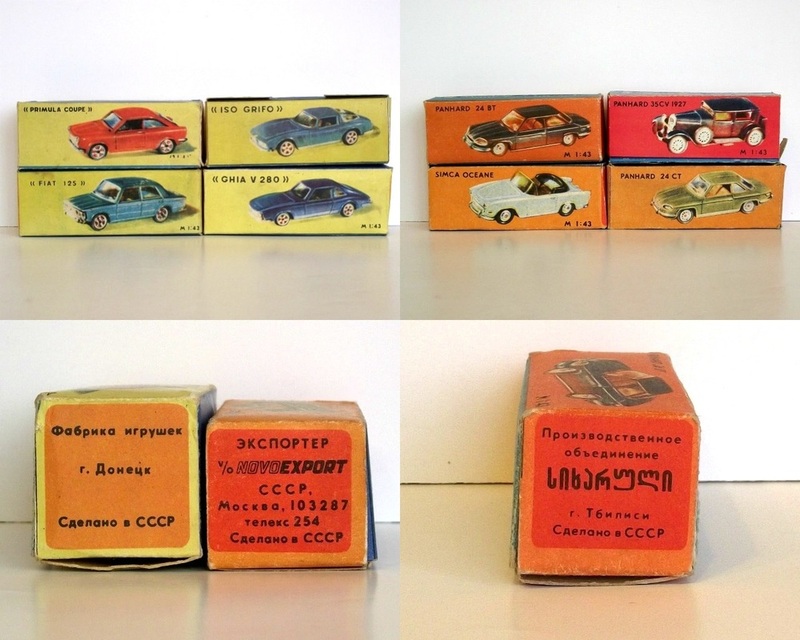 Also the card board box from Donetsk was slightly larger with the model car pictured on a yellow background while the box from Tbilisi was slightly smaller with the model car pictured on a orange background. 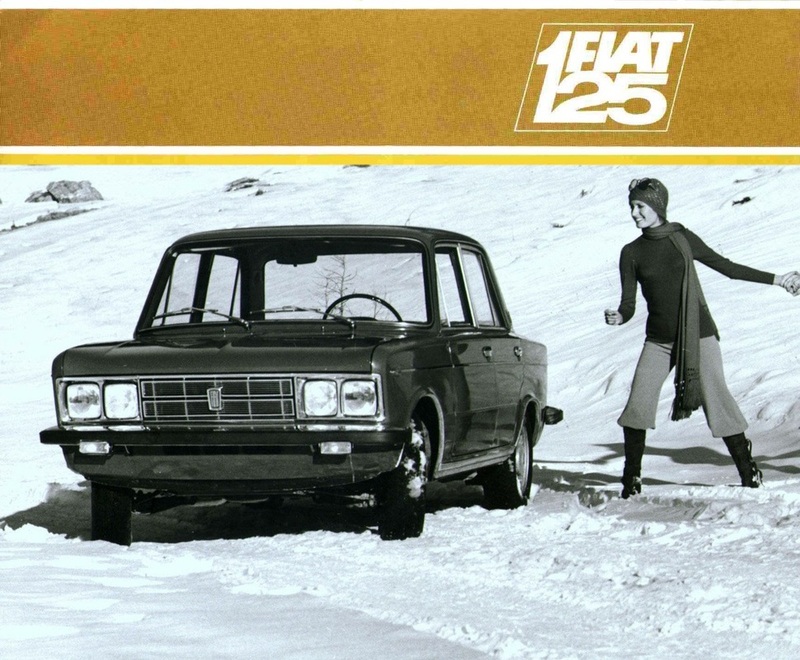 The Fiat 125 was a large family car introduced by Fiat in 1967 and produced by them until 1972. 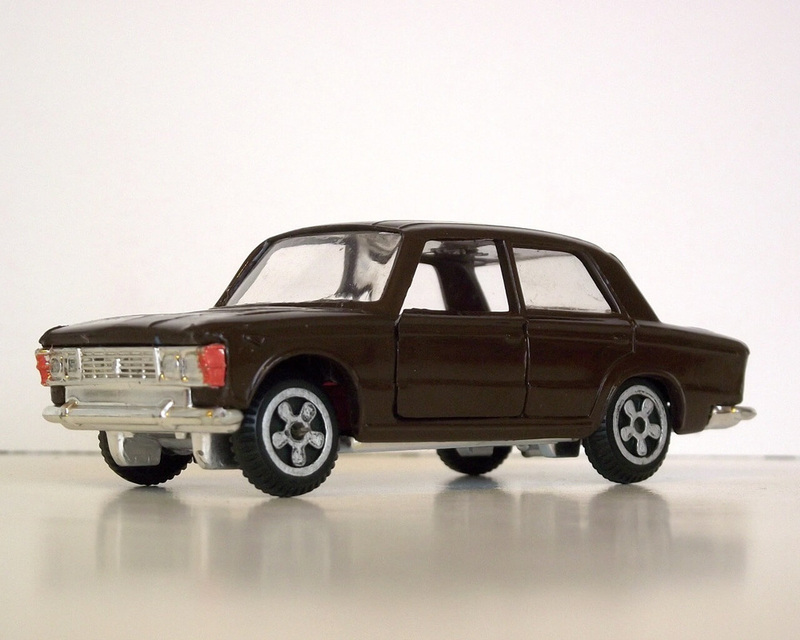 This 1:43 plastic scale model was made by a factory located in Donetsk (Донецьк), today a large city in Ukraine. 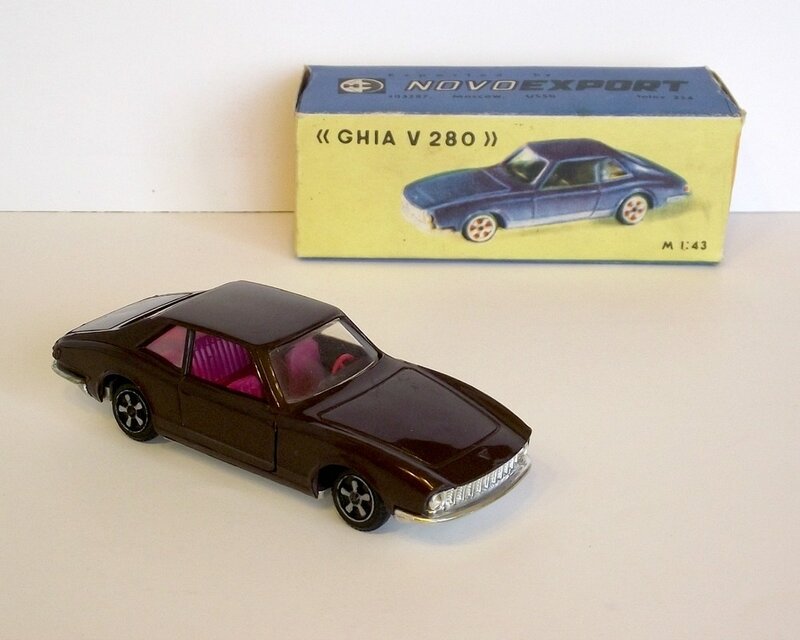 It was exported by the official export company of the USSR - NOVOEXPORT. 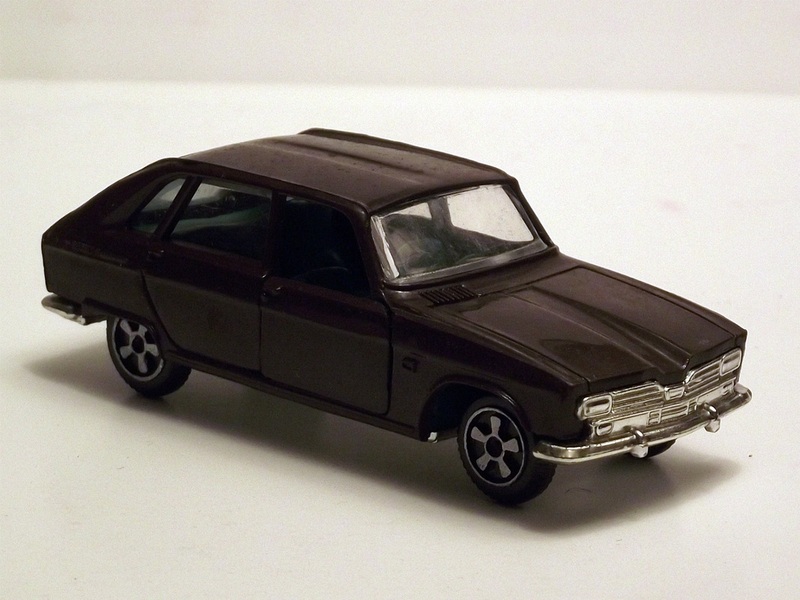 Many models from this series had this chocolate brown colour and red interior. 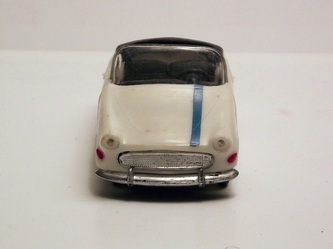 The turn signals and tail light were not painted, I painted them as a child. As you can see from the pictures only the doors were opening. 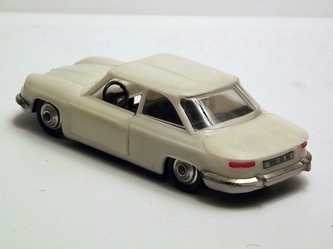 Here's a scale model built in the former USSR of a car that was originally built by Chrysler (USA) with a body design created by famous car designer Ghia from Italy. 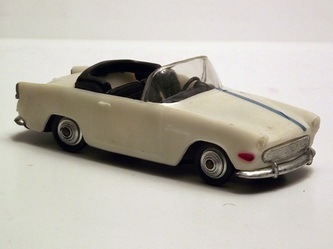 The original car was introduced in 1964 at the Paris Auto Show. 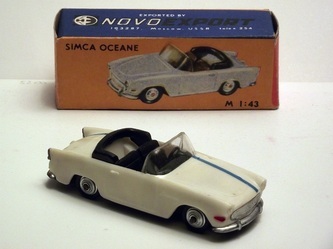 This 1:43 plastic scale model was made by a factory located in Donetsk (Донецьк), today a large city in Ukraine. It was exported by the official export company of the USSR - NOVOEXPORT. 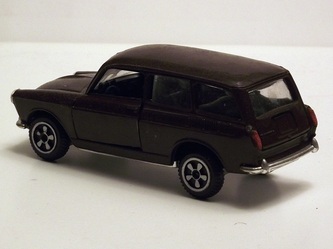 Many models from this series had this chocolate brown colour and red interior. 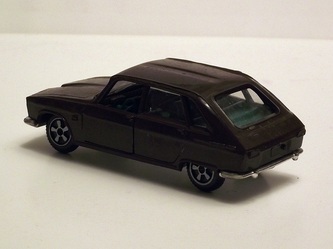 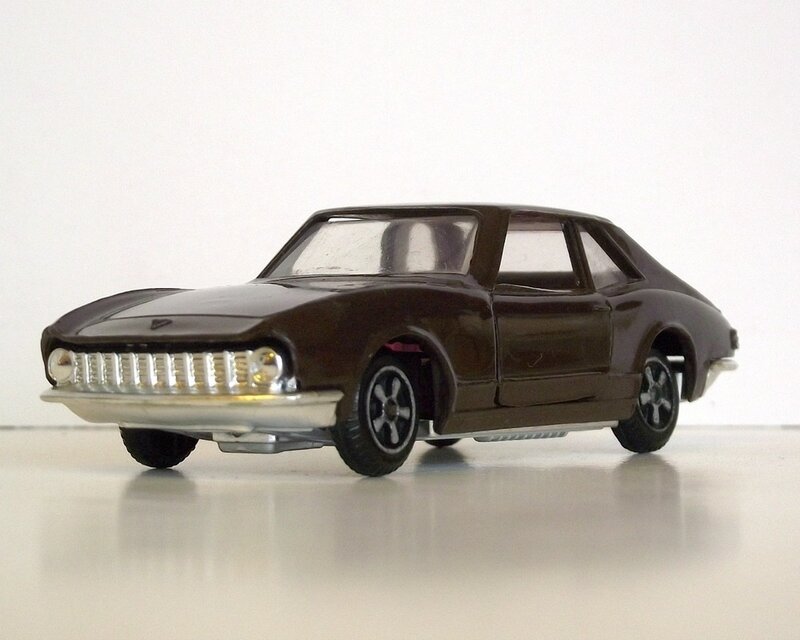 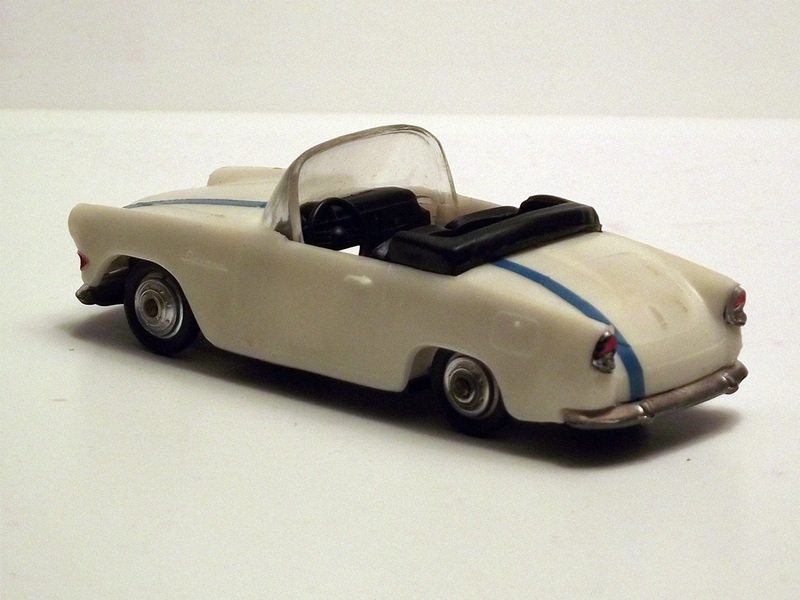 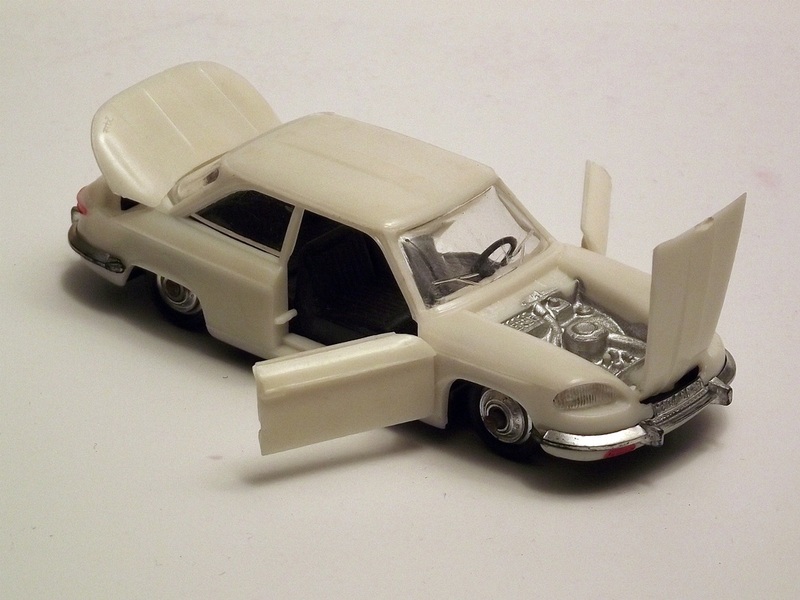 As you can see the scale model is simply presented as GHIA V280 without any details regarding the origin of the car. 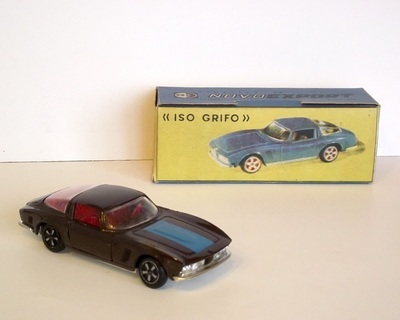 The Iso Grifo was a limited production grand tourer automobile manufactured by Italian Iso Autoveicoli S.p.A. between 1965 and 1974. 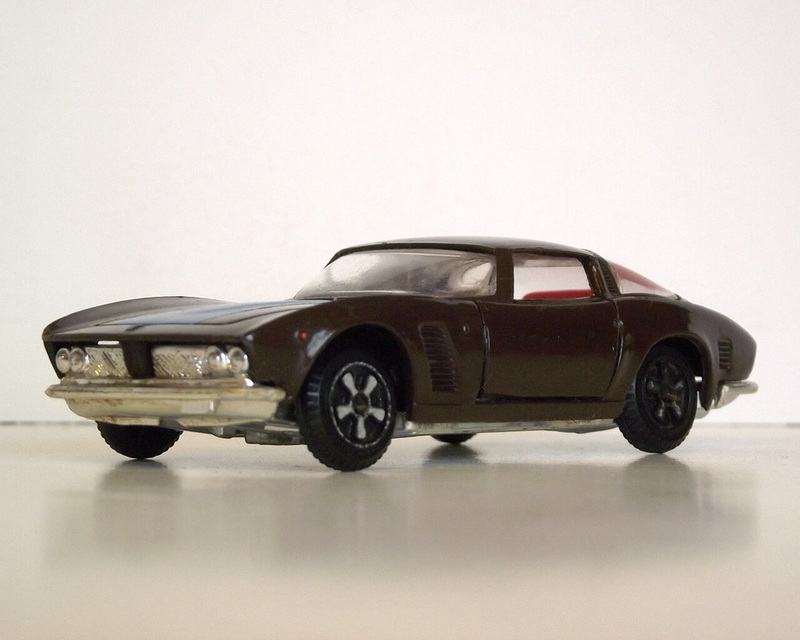 Intended to compete with Ferrari and Maserati GTs, it utilized a series of American power trains and components from Corvette and Ford. 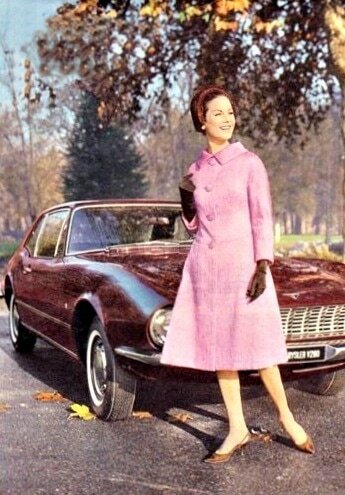 Styling was done by Giorgetto Giugiaro at Bertone. This 1:43 plastic scale model was made in a factory located in Donetsk (Донецьк) today a large city in Ukraine. 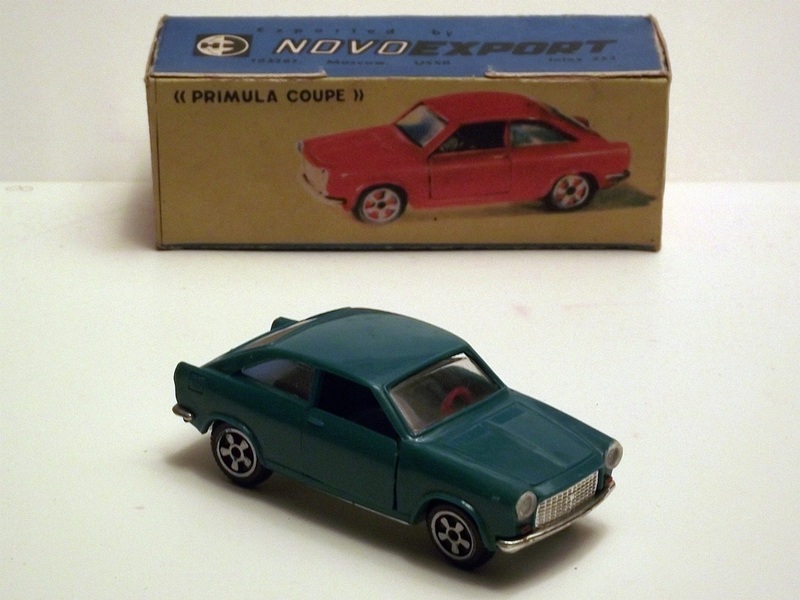 It was exported by the official export company of the USSR - NOVOEXPORT. Many models from this series had this chocolate brown colour and red interior. 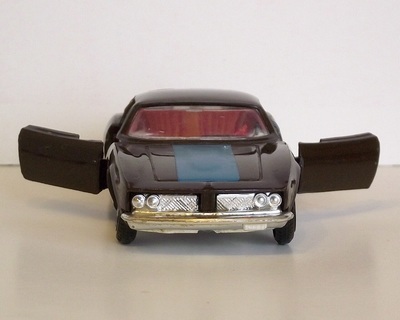 The turn signals and tail light were not painted, I painted them as a child and also added a tow hitch for a boat trailer that I made. The "racing stripe" was also later added using decals from a VEB Plasticart kit. As you can see from the pictures only the doors were opening. 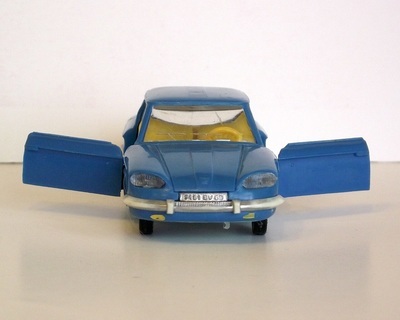 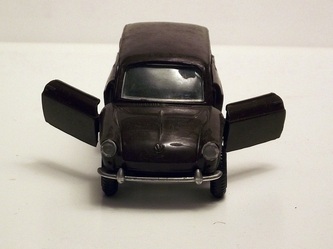 This plastic scale model car was made by "Siharuli", a factory located in Tbilisi, Georgia sometime in the late 70's. 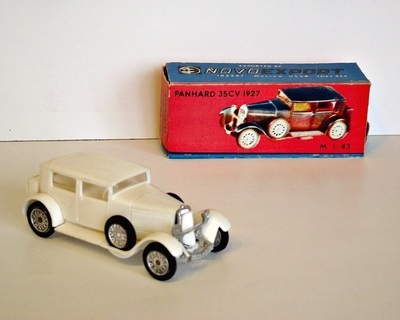 The model is presented as PANHARD 35CV 1927 at a scale of 1:43 and there is no catalog number as used by western manufacturers. 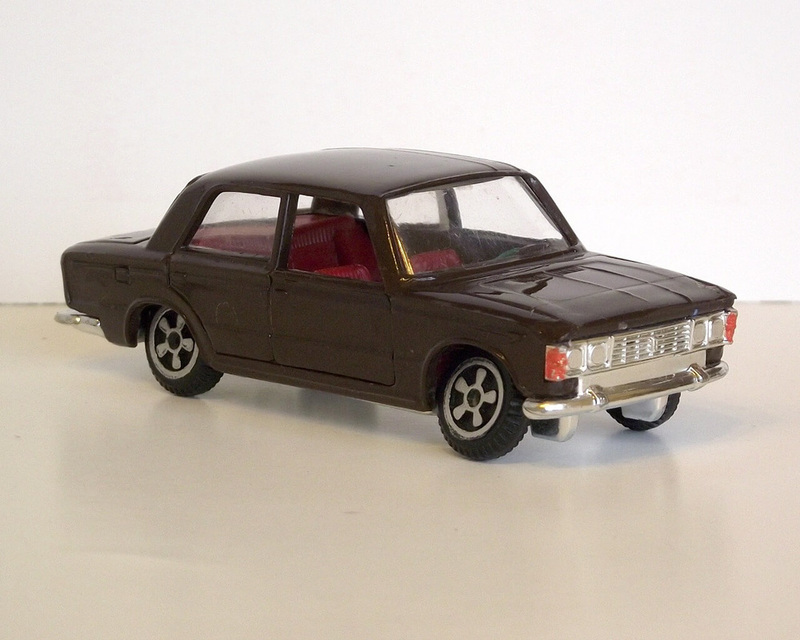 This model does not use the standard wheels fitted to other models in the series but a custom spoke wheel. 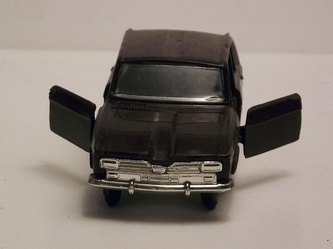 The engine hood can be removed completely while the door of the "luggage box" can be opened. 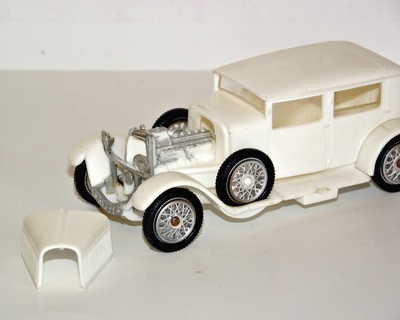 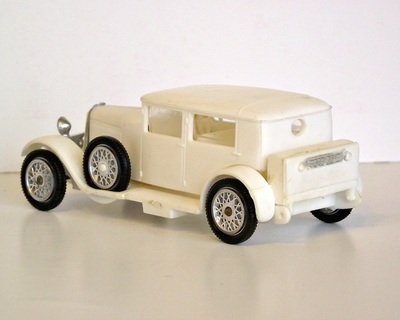 The model is based on the PANHARD-LEVASSOR 35CV 8cylinder luxury car made in France in the mid 20's. 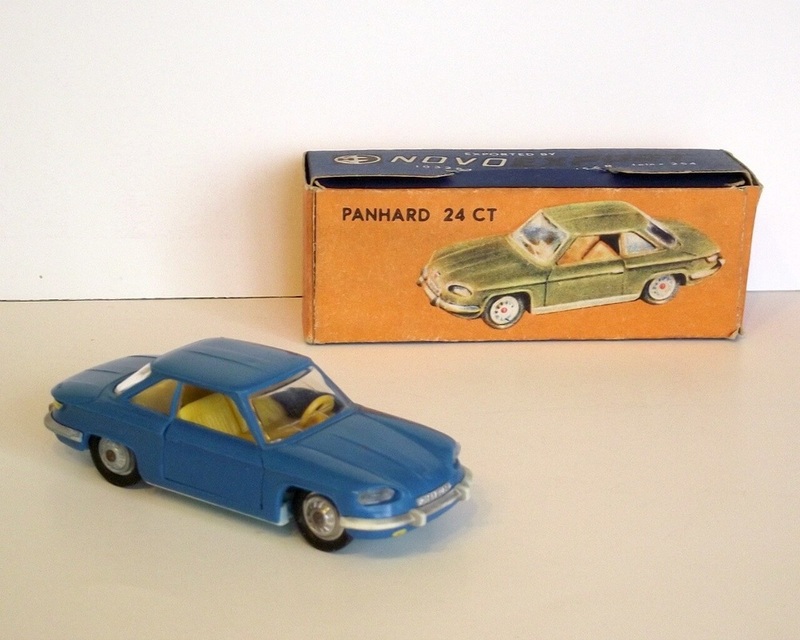 They have manufactured cars until 1969 and today it is part of the PSA group who builds military vehicles under the PANHARD brand name. 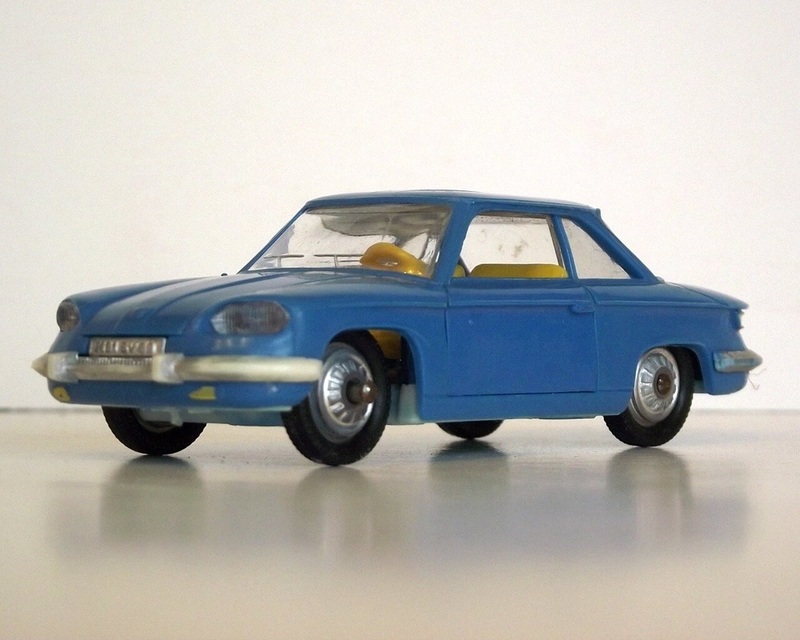 The Panhard 24 was a compact two-door coupe with a strikingly modern body. 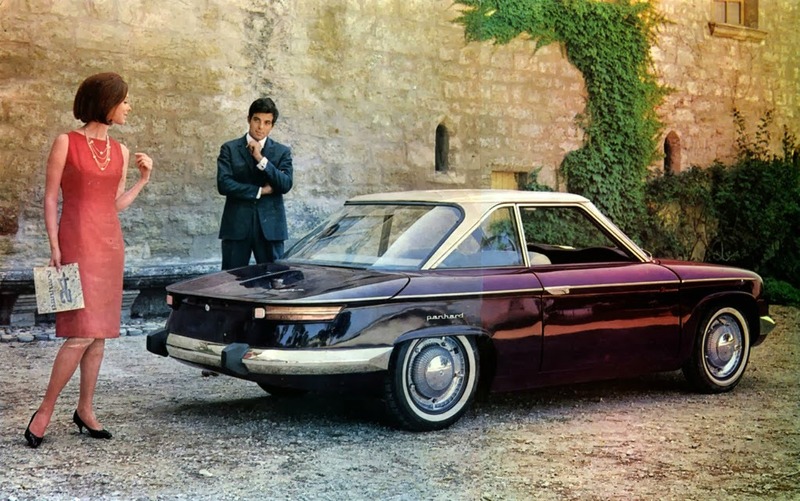 It was produced between 1964 and 1967 and powered by a front-mounted air-cooled two-cylinder boxer motor. 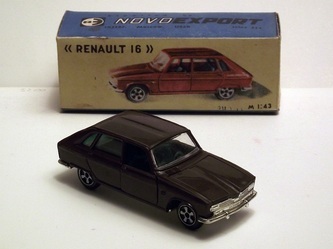 This 1:43 plastic scale model was exported by NOVOEXPORT - USSR. 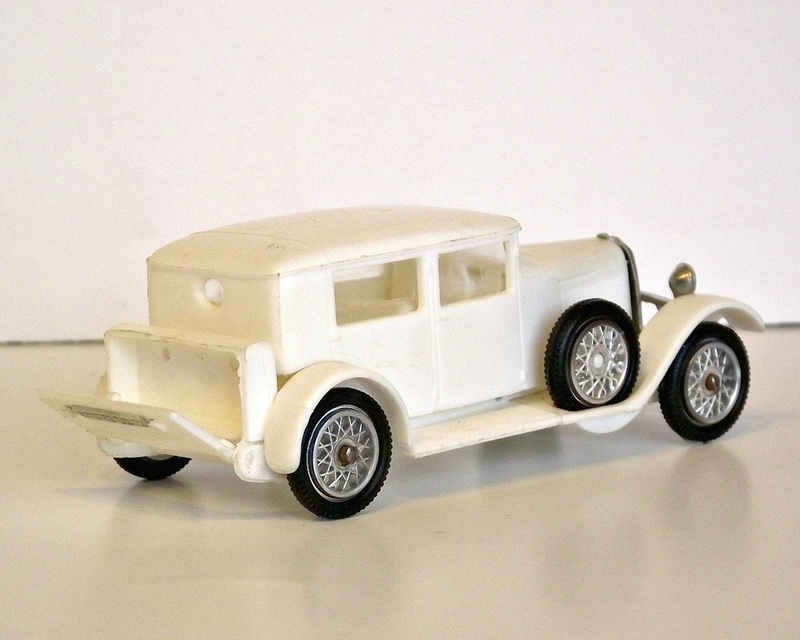 The factory was located in Tbilisi, the capital of todays Georgia. 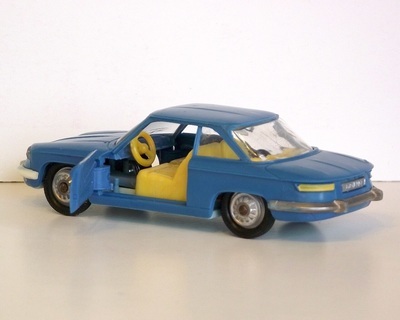 As you can see from the pictures the doors, engine compartiment and the trunk lid can be opened. 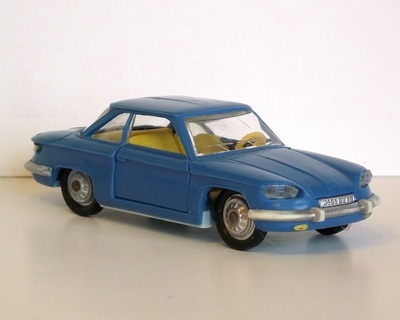 The Panhard 24 CT was a compact two-door coupé automobile produced between 1964 and 1967 by French manufacturer Panhard. 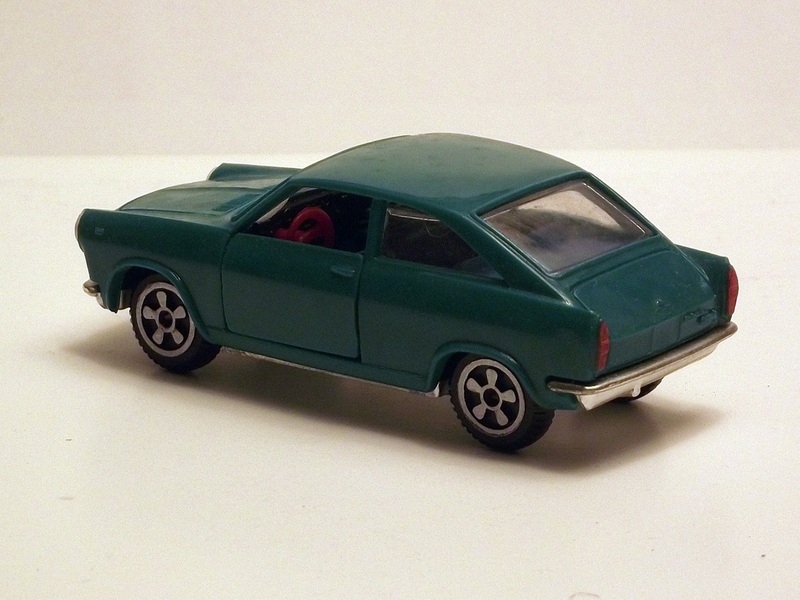 It was powered by a front-mounted air-cooled two-cylinder boxer motor. 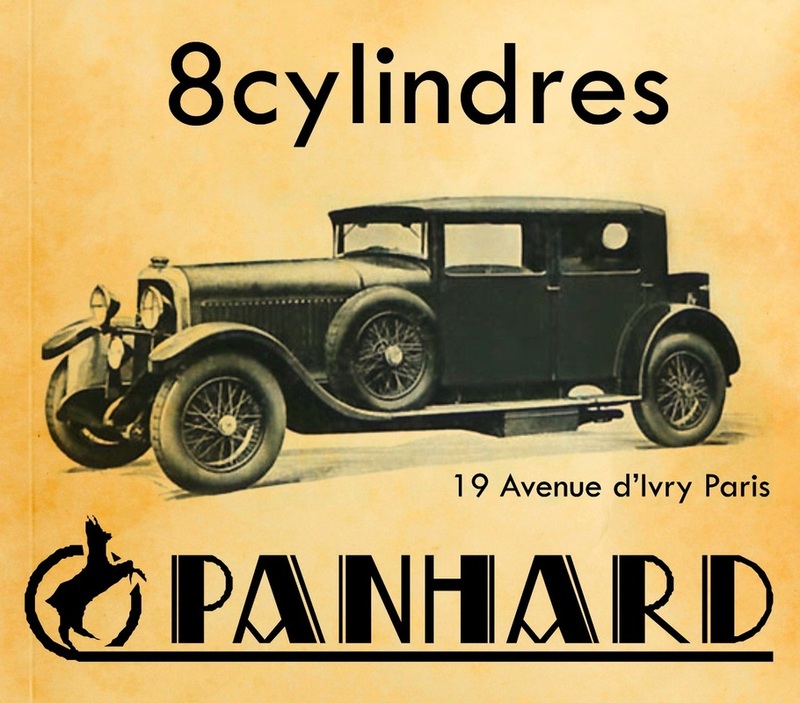 Panhard was among the earliest automobile producers and, by some criteria, the first volume auto producer in the world, back in 1890. 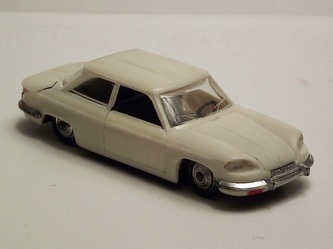 In 1955 Citroën had taken a 25% holding in Panhard's automobile business and from this time onwards the two brands were increasingly managed as a single range. 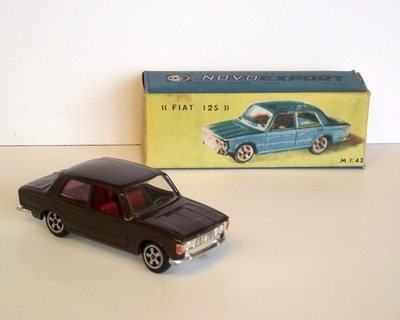 This 1:43 plastic scale model was made in a factory located in Tbilisi (capital of todays Georgia) and exported by the official export company of the USSR - NOVOEXPORT. 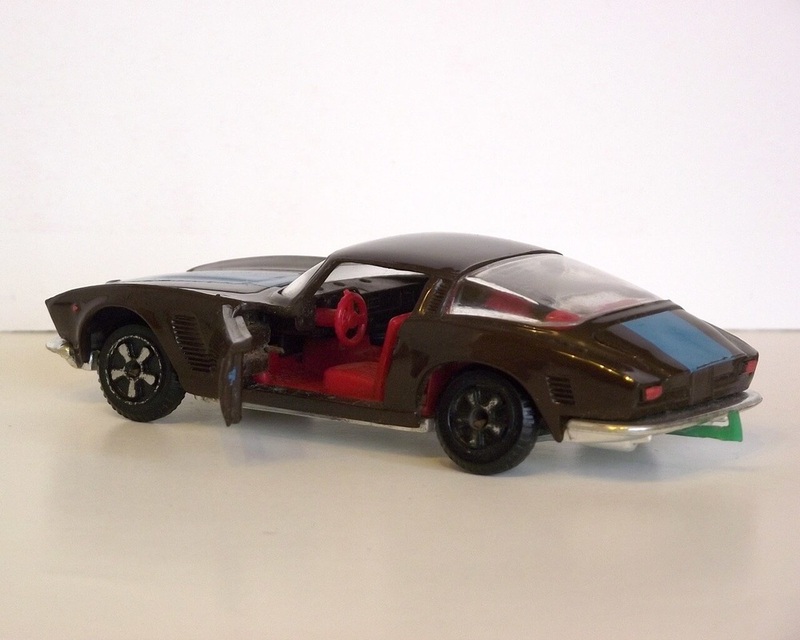 As you can see from the pictures only the doors were opening. 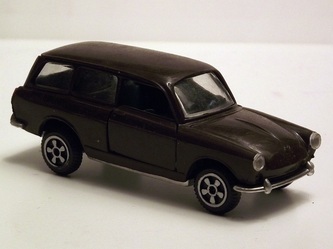 This was a model introduced by AUTOBIANCHI (a subsidiary of the FIAT Group) in 1966. 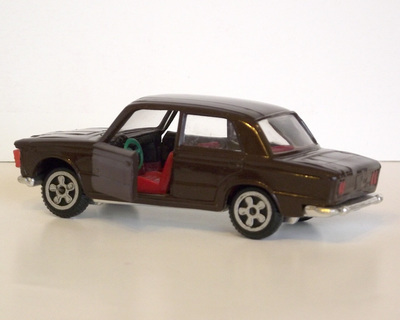 It is a FIAT 124 powered model made under the AUTOBIANCHI Primula Coupe name and it was FIAT's first automobile with front-wheel drive. This 1:43 plastic scale model was exported by NOVOEXPORT - USSR somewhere around the early 1980's. The factory was located in Donetsk (Донецьк) today a large city in Ukraine. 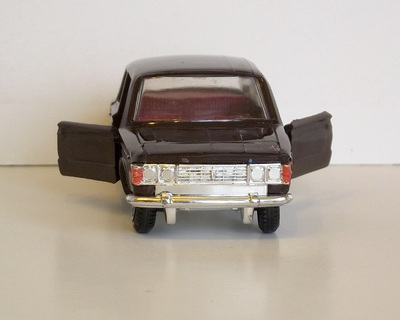 As you can see from the pictures the doors are opening, but no further details were given. 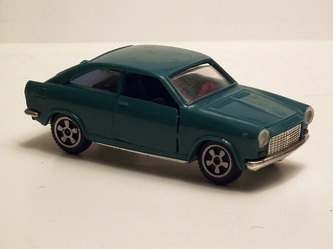 It was simply presented as "Primula Coupe"
The RENAULT 16 is a hatchback produced by French automaker Renault between 1965 and 1980. 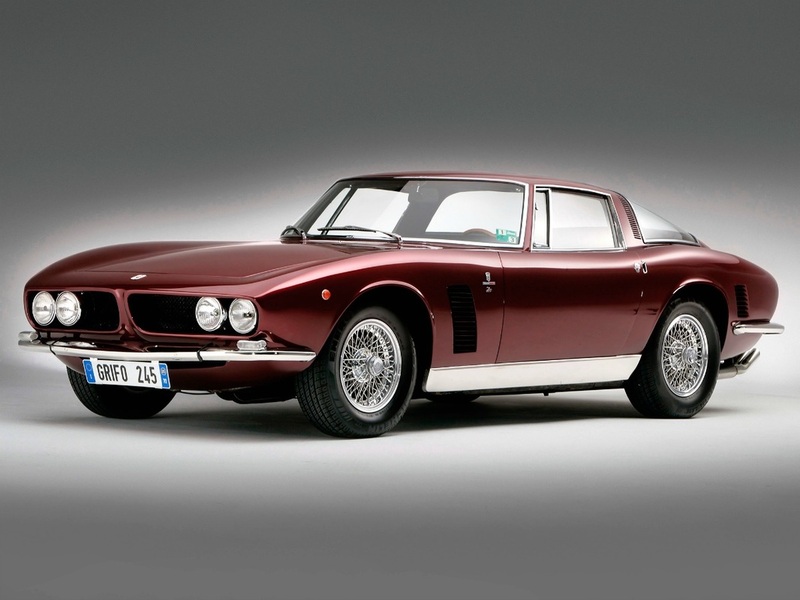 It was voted European Car of the Year by a board of European motoring journalists in 1966. 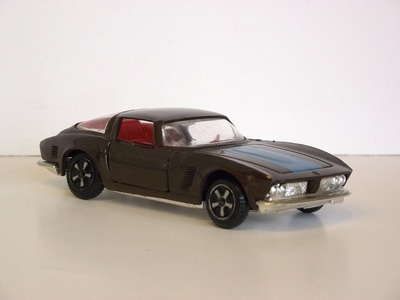 This 1:43 plastic scale model was exported by NOVOEXPORT - USSR somewhere around late 1970's. The factory was located in Donetsk (Донецьк) today a large city in Ukraine.It is a plastic model with chrome bumpers and doors that open. 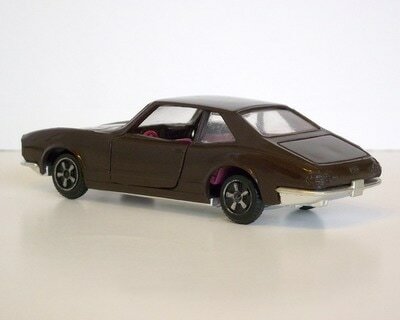 Most models from this series were chocolate brown. The Simca Aronde was a family car manufactured by the French automaker Simca from 1951 to 1963. The Simca Aronde Oceane convertible was presented in 1958 with the launch of the third series, the P60. This 1:43 plastic scale model was exported by NOVOEXPORT - USSR in the early 1980's. 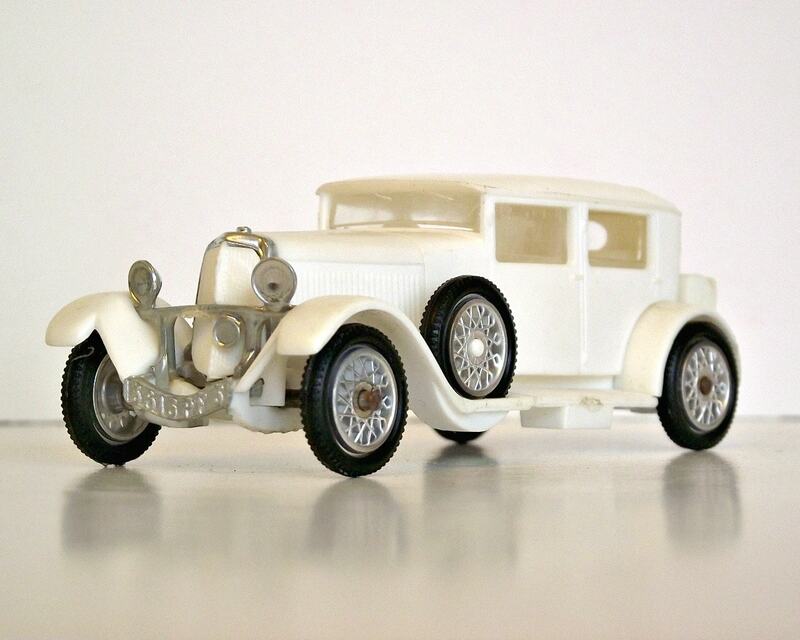 The factory was located in Tbilisi, the capital of todays Georgia. 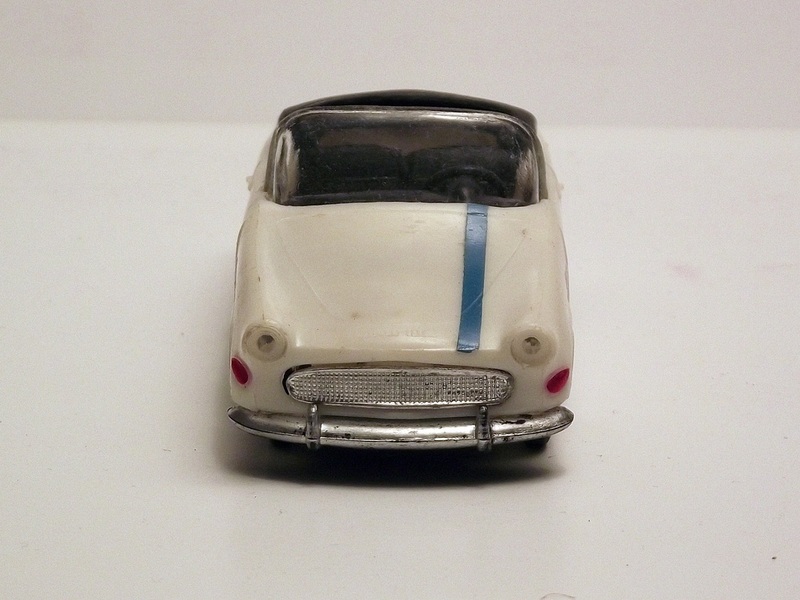 This series also had chrome bumpers and front grills, and they all were white, without the blue stripe. The Volkswagen Type 3 (sold as the Volkswagen 1500 and later the Volkswagen 1600) was a compact car manufactured and marketed by Volkswagen (VW) and introduced in 1961 at the Frankfurt Motor Show (IAA). 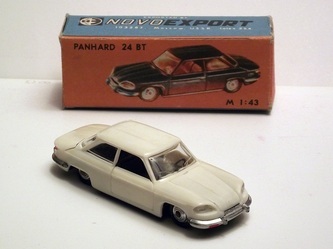 This 1:43 plastic scale model was exported by NOVOEXPORT - USSR somewhere around late 1970's. 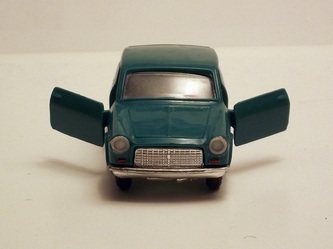 The factory was located in Donetsk (Донецьк) today a large city in Ukraine. 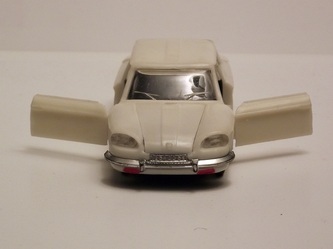 It is a plastic model with chrome bumpers and doors that open. Most models from this series were chocolate brown.